You're probably already aware that Everlane has been one of the best sources for wallet-friendly basics since the moment it debuted, but its latest product collection launch is a first for the brand—graphic tees (and sweatshirts). But not just any graphic tees. The collection is called the 100% Human Collection, and it endorses a socially conscious message. According to the brand, "[The collection] is aiming to promote a message of equality and inclusiveness. Each product bears the slogan as a reminder that no matter what we may believe, we all share the common thread of humanity." In addition to making a subtle yet powerful statement, the tees and sweatshirts are very stylish in the minimalistic way that Everlane is known for. 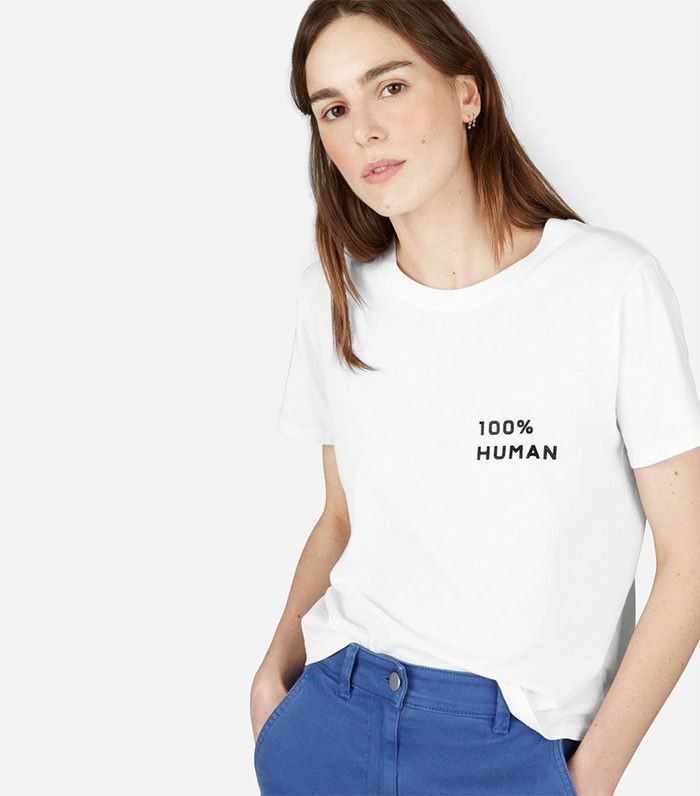 Each of the tees and sweatshirts in the eight-piece collection features the phrase "100% Human" printed either on the chest or across the front, and each comes with a free pin bearing the same phrase. After only just being released today, almost all of the unisex styles are sold out, and we predict that the rest of the collection will soon follow, especially given that it ranges from just $22 for the graphic tees to $50 for the sweatshirts. Keep scrolling to shop some of our favorites from the collection. This will look so fresh with a pair of high-waisted skinny jeans. Make a bolder statement with this black and white option. We're smitten with this cropped silhouette. One can never have too many cool sweatshirts. Next up, check out this editor's ode to another Everlane favorite.